Celebrities hunt for antiques across the UK. Actors Susan Cookson and Suzannne Packer battle it out around the north west of England. Browse content similar to Susan Cookson and Suzanne Packer. Check below for episodes and series from the same categories and more! of drama and very good pals. -Here we are in this gorgeous car! -And not a scalpel to be seen. Not a scalpel... No more resus, Sue! -It's like being out of school, isn't it? to a spot of antiquing. -Sue, I know you're going to beat me. -Do you know what, I'm so not. -You know a lot about antiques. -That's only because I'm old. to Land Girls and top soap Coronation Street. She first appeared as Dr Maggie Coldwell in Casualty back in 2005. Now, you say yes if I touch a sore spot, OK? episodes as nurse Tess Bateman. A block of flats has collapsed on the Middlehill Estate. No, my...my daughter teaches there twice a month. ranging from Dirty Work to Grange Hill. -Leave it to the experts! "What do YOU think looks good on this stall?" And we have just the expert guidance for you. I've been known to put people in the emergency position. But very often not during an emergency. auctioneer James Braxton and dealer David Harper. -around for a long time. I think they're going to be consummate professionals. And, you know, you never know, they could be antique collectors. Have I ever even been into an antiques shop? -Ever ever? I don't think I have! I don't think I have, you know, Sue. the country in this 1960s Triumph Fury and a 1965 Sunbeam Tiger. Yeah, what a car, isn't it? What a great car. -That is a cracking car. Hello! Good morning to you. This is a beastie of a car. Oh, yes, I think it suits us. -We're very excited about this. -Antiques is the way forward. The way forward? I thought it was the way backward! Sometimes you need to take a step back to move forwards. -That's the way we look at it. And we're both convinced that the other's going to win. Shall we have the Tiger? Do you know, I was born in the Year of the Tiger. Come on. And I love tigers. Dragon, Tiger. We've got the Fury. I've got a tigress in a Tiger! You've got a tiger in a Tiger. - See you, guys. - Bye! and byways of South Yorkshire. into Lancashire as they head for an auction in Warrington. Honestly, I have zero knowledge of antiques. I can just make it up as I go along and you're going to believe me. What will the others look for? -Arts and Crafts. So do I. And William Morris's famous "It either has to be useful or beautiful." Anything in your house should be useful or beautiful. So I need a very big skip. That's what I need in my house at the moment. It sounds positive all round. At least local girl Susan is in for a treat. She'll be showing James around some of her old haunts. So you've been here before, have you? This family-run business is crammed to the rafters. So, plenty to get stuck into. They're so much, isn't there? All the flotsam of life, isn't there? Come on, see, because we're going to win Suzanne, see. What would you do with a glass egg? Where are you going to put your glass egg? -My friend had a pram like that. And I used to go and play with it. "Can I play with your Jill's pram?" She was a bit old for it. So I would play with it. When I was about, yeah, 23. So it's a stone, like a crystal. And often associated with Scotland. And moss has been just caught, like fossils. still getting to grips with what they might be looking for. -So you're interested in social history. Is there any particular period of time that really intrigues you? And I doubt we're going to get bits of antiques from there! Just blown my idea, yeah! Couldn't you say something like the late 19th century? a bit of a gap for me. Right, let's try and find something from 1530. -I doubt whether that would be possible. I wonder how the other pair are faring. Now, why do you like that? -Well, I think it's very fashionable at the moment. What are they saying it is? Do you think it's Deco? It's later, isn't it? It's later. Do you think it's more '50s? -Yeah. I think it's more '50s. You know, Deco wouldn't have the frilly bits, would it? Deco was all about angular lines, it was about the new industrial age. But it wouldn't have had that engraving in it, in the glass? Then you get the frilliness towards the late '30s. -So you start getting flowery, cottagey things. So that's either late '30s or '50s. Shall I dare to take it off? It's a lovely back to it. -A heavy back, isn't it? -Let me get over here. I think I'm getting too big for antique shops, you know. It's rather like having a sort of rhino coming in. -But good nick, isn't it? Let's forget it has a price tag. Let's see what owner Jill has to say. -Susan's got one at home. Well, we can't do £3.50 on it. What was you sort of thinking? -A conflab with my husband! Because then it's not just on me! Have a conflab with your husband. Oh, I think you should shake Jill's hand. -It's always nice to buy something of quality. That sounds like a great deal for a nice item. The 1950s mirror is yours for just £50. of the forgotten women who helped win World War II. of the men who'd left to fight the Nazis. Here in Sheffield, their work was vital. one of the city's heroic women of steel. How did you get to work in the steel industry here in Sheffield? And you got your calling-up papers just like the...the boys did. and the men were terrible. -They didn't want to show us anything. Was it that unusual to see women in a factory? Yeah, they didn't think we should be there. and we all became good friends. despite the hardship and strain of wartime working demands. We lost our youth, having to work long hours in the works. and that's how I went on for four years. was a constant companion to workers. So this noise would be going all day long? -There was a steam hammer. And that was going 12 hours, nights and days. That's what caused my loss of hearing. and they took greater risks in harsh conditions. -because they could work quicker. and you'd think, "Oh, dear, what's happened now?" The factories were a prime target for German bombers. a reported 300 Luftwaffe aircraft bombed Sheffield for nine hours. When the sirens went, just popped a tin hat on. Where did you go when the sirens went? We didn't go anywhere. We carried on working. -Fully expecting to be bombed. No. Because we couldn't stop the machine. -So we had to stay with it. with a hard hat on, which will not protect you from a German bomb. Fully expecting to be bombed. Well, if it's got your name on it you'll get it. -We became very philosophical about it. -You'd rather face the bombs! I preferred the bombs to the rats! I think I'd rather, too. You're not alone there. the attacks did not deter the workforce. ..get the stuff that the boys wanted, you know. for the women I think we would... we could have lost the war. by a statue erected in their honour. How did this come about, that you managed to get this statue? for what they did in the war and we weren't. and I hope they like it. to the village of Elsecar. Go on, Sue. Get in there. -Nice to meet you, Carl. Good to meet you. Good to meet you. -What a lovely place, isn't it?! was made during the Victorian era. They really pumped it out. But it's just the base. Look at the base. It's not quite right. And it's that new... quite new-ish slate. -Always look at the bases. So, this is it, this is your shopping experience. -It's a bit overwhelming, don't you think? Let's find out your taste. -So the pressure's on you. What do you like? See, this appeals to me already. Go on, tell me why. -when you get home the big piece is waiting in your house. I get the impression you're a bit tight. Come on, what else do you like? -ornaments that are of people of colour. -Because when I was growing up, you didn't see that. ..you know, European-looking, or...certainly white. Erm, I've never seen those figures before. No, so do you know anything about these? Well, I can tell you from here that they're probably glazed terracotta. or is it just that they've been grouped together? -I think they've been grouped together. maybe in the last 20 years or so. Worth a closer look, perhaps. I can absolutely tell you that it's not a machine, factory-made thing. -This is in a little workshop somewhere. -Yeah, I know, I would agree there, because it's not perfect! Which makes it really charming. And that does... Yeah, that does add to its charm. it's probably not the best-looking baby I've ever seen. I think they were half-asleep when they did the baby. -They didn't do badly with the mum. -The mother looks all right. I think they were in a rush when it came to the baby. Yeah, they could have spent a bit more time on the baby! so what do you say, Carl? The good news is, collectively they add up to about £50. Would he go for complete half-price, do you think? -Carl, I can only apologise. And then that's a good deal, isn't it? Don't shoot the messenger, but I'm going to say yes. You're very good. You're VERY good! -Shall we shake on that, then? That's Suzanne's first purchase of the trip. £25 for the five figures. Something to brag about, then. So, what have they got behind their backs? -We've bought. We've bought five objects. I didn't even realise, but we have. Don't worry, don't worry, they're toying with us. We've been in for, what, ten minutes? The absolute truth is we have bought five. Ten minutes and you've peeled off a tenner. I'd keep your eyes on the shelves. Oh, what have you found? Look at that. Isn't that lovely? And all made of oak, isn't it? It's much collected, isn't it? -Did he make it for TV suppers? -Well, he might have done. He might have done. Catching up with the times. which has been continued by his family company. This one has a ticket price of £290. What could that be, Carl? Well, I'll try, and I'll say 200 quid. She doesn't sound convinced, James. Well, it's much sought after, and one to keep in mind. And then, it's really tight, isn't it? so when they were finished, they were always tight. and it should be polished. Is it all right? Not cracked? -And then you've got silver around the edge, there. That's... That is very lovely. What do you think, Carl? Well, that sounds promising. We could have a deal in the offing. What are the others up to upstairs? -Now, they probably aren't worth very much maybe now. -I can sell them on and I could make myself a pretty penny. -I think they were chocolate biscuit box makers. -They scream the 1950s, don't they? And '50 things are quite cool and quite trendy. Yeah, '50s stuff is really cool at the moment. -You know I hate spending money, David. -I think you're going to shock me, aren't you? Do you think I would've picked them up at £200?! No! -£2. You can't go wrong, can you? I'm not going to negotiate on this one. -I know I'm being a bit soft. I know, I know, it's not my usual form. You've lost that hard edge, I'm so disappointed. -That hard edge is gone. Well, Carl still has some business to settle elsewhere first. Come on, he's a kind man. I really love the mouse. -Well, we'll have to have a deal, won't we? We have to have a deal. -Yeah. I think we should. I would shake his hand. and we've got two really lovely lots. -Yeah, yeah, I'm happy with that. That's a sizeable £220 for two items. Right, Carl, your work is not done just yet. We're ready to settle up, aren't we? I think we're done, Carl, yeah. We also would like to take these. -So, we owe how much? They were actually £2 each. -Oh, that's a bit expensive. -Oh, here she goes! Right, OK.
What about just £2 for one and chuck the other one in for free? A two-for-one deal, Carl, that's all she is looking for. -I think we've got room for that. by polishing off their shopping for the day for just £27. Time for our celebs to catch up and swap notes. -Yeah, brings down the value, doesn't it? -That will show its age. And if it hasn't got woodworm, it could be a repro. What happens if it, like, comes from Buckingham Palace? The spit and polish they put on those things. Yeah! They'll be really upper crust woodworm. They're only going to eat the best wood. Another day dawns on our road trip. I've got to say, James, you are looking red hot. And time to reflect on everyone's performances today. Did Susan buy what she likes? not quite grimace, but disappointment. -I felt sorry for James! Most of the time I was just standing there, like, "I don't like that." And a couple of things, he said, "Do you like that?" I said, "No". So, you were do your job properly, then, were you? -No, I did my job dreadfully. I think you're being modest there. leaving them with a rather grand £373 left to spend. Oh, I get the impression you're a bit tight. Right, let's go. Go on. ..Leaving them with £130 in their pocket. Time to get everyone back together again. Look at the big smiles! -You two look very happy. Well, we'd better go, because we're short of time, now. They've only bought a couple of sort of slightly underperforming lots. Oh, that's not very kind. We might just go and have a light lunch! No, I know where this is going to end. And they'll be my tears! as we embark on another day of shopping. We're away! I'm into this now. Yeah, you should be worried for your job, now. We were really stuck in the 20th century yesterday. We were. What was it, '50s and '80s? -We've got to get serious today, David. -All right, I do apologise. Do you know what? I think he went easy on me yesterday. -OK, let's try and find a real antique, shall we? in the market town of Penistone. So, we're going to get serious, eh? We're going to buy a real antique. Definitely. We've got to. It's a competition, after all. Time to get serious, then. I'm not sure what they were doing yesterday, but never mind. -Nice to meet you, I'm Ben. David, David. Good to see you. Nice to meet you. This yours? It is, yeah. Mine and my dad's. -Show me what you like. -Oh, God, I've got a bit nervous. -No! Where's this come from? -Got a bit serious, now. Did anyone catch if they were taking this seriously? Right, David, time to take a celeb under your wing. -a cabinet that you like the look of. -Oh, yes, no, I see what you're saying. Like you bypass cupboards I just have no interest. So, what does pique your interest? I don't even know what it is, but it looks very old. Ah, well, there you go. That's where you put your ticket in. You had me for real, then. Gonna kill me! What's that say there, now? -Right. That lifts way up there. Oh, listen. Ah, there you go. OK.
You are interested in time travel. -And people and connecting to people from the past. -I'm now going to take you on a journey into the past. -Real people heard 100 years ago. Ready? I definitely did. I definitely did. -We're not going to buy this, though, are we? I think it's a bit wild! It's an oddity. because you can't value them. but dealer Ben has priced it up at £48. Look at those screw heads. They've almost disappeared into the metal, can you see that? I don't know how to respond to that! "Look at those screw heads!" -Am I meant to get excited?! -Now, I am interested in purchasing this. But I think this is a little excessive. So what's your best price at this current time? I'd take a chance, it's not much of a chance. We might lose £18, right. An old ticket machine at better than half price. Anything else catching your attention? What? What have you been drawn to? -See if you can tune in. Well, if you want to look at the hat. No, that doesn't appeal to me at all. -And it's very close to you. It's just cool and trendy. -Yeah, go on, what would you put in there? -I would put maybe a tea service. It's a sideboard for a dining room. You'd put bottles of liquor. What would you have? I don't know. What would you have? Babycham. -Babycham, you'd have in there! -It's in very good condition. -a London interior design shop. And it's going to be several hundred pounds. OK, well, it's marked at £50, reduced. I think it's remarkably cheap. -Do you want to talk to Ben? -Yes, let's talk to Ben. -I mean, you are, you've actually convinced me. Ben. OK, I want to make an offer on this. -It's going to have to be £35. Meet you in the middle at £30. Go on, then, you've got a deal. because I think that's an excellent deal. So, David and Suzanne's tactics are clear. The mid-20th century sideboard is theirs for £27.50. -I'm not so nervous, now. -We've done really well. Great. and heading towards the city of Sheffield. When I was on Casualty, I used to get lovely letters. -I don't think I ever got a nasty letter off anyone. or "can you recommend something for my haemorrhoids?" No, I can't, I'm an actor! to spend some time in the Botanic Gardens. in the heart of a thriving industrial city. Here to tell all is curator Ian Hunter. and gardens around the city. and actually, we needed green spaces for people's health. for the study of medicinal plants. of new and exciting splendours. although the attraction wasn't just restricted to the plants. so we had bears in the bearpit. We also had a troupe of monkeys, and all sorts of our animals. You're standing in the bearpit here. was limited to travelling menageries. within Sheffield's new Botanic Gardens drew in big crowds. with access limited to just a handful of days each year. A membership fee meant only the wealthy could enjoy it. The garden went through various times of sort of boom and bust. and that's when the gardens were made free to entry for everybody. became popular in Victorian Britain. -How big is the garden? -The garden is about 19 acres. So it's... It's not huge, but it's a fair size. -It's very intense, though, isn't it? -There's a lot of work here. -very formal areas as well. Robert Marnock's designs were in the gardenesque style. within Sheffield's Botanical Gardens in a very fastidious fashion. so it can have its full crown, beautiful symmetrical crowns. and the beauty of each plant. one of the best examples of the gardenesque style of design. who maintain the neat and lush surroundings. Time for Susan and James to earn their crust. I'm worried about my hole, I think it's a bit deep. I'm...I'm quite tired, having done all of this now. -But can you not ruin this last bit?! You've got to get the lines right. -Yeah, get the lines right. -Don't ruin all my work! -I know, you've done a fabulous job. and a peaceful haven in the heart of a bustling city. Still in search of that elusive item of a certain age. Are you... Is this all yours? Not all mine. We are a collective. -But I am the Big Cheese, as they say. The Big Cheese?! We're honoured! How very mature and tasty! Right, you've got a whopping £325.50 left to spend. -Who do we have here? -Is he the Buddha of Good Fortune? -I'm going to rub his tummy. I don't think he's Victorian, however, do you? -I don't even think he's wood. -I quite like those candlesticks. -Do they look old to you? -No, they don't look old. -We're barely looking at anything at all. -I really need to focus here. -Shall I find something really old? -Let's find... Oh, please, yes. -OK, follow me, follow me this time. -Let's find you something old. and the home to their final shopping destination of the trip. -James, Rachel, pleased to meet you. -Hi, Susan, Rachel, pleased to meet you. Nice to meet you, Rachel. We want some really lovely little pieces. -and perhaps a bargain as well. -Yeah, we definitely want bargains! -You heard it here first. -This is the right place to come. -Take us to your bargains. that I think you might find. I'm sort of thinking Arts and Crafts. -Already waiting for you there. -Look at that! That's Arts and Crafts-y, isn't it? Is it marked at all? Always look for that. Lots of stuff came from the Lake District, didn't it? -So they had a lot of copper deposits up there. So, wherever you find the metals, you tend to find the schools. There's no maker's name, but a ticket price of £12. What can you do on that? Well, I think we can do a fairly decent place on that. Oh, don't... Is there a price? -Yes, there is a price. -I never seen a price. -There's a price on that. -What was that, a fiver? you're maybe pushing it a bit too much. Erm, we could perhaps do eight on it. and I could not push that any further. OK, the Saints, six go on them. Blimey! Susan's become quite the negotiator! That's a speedy and rather good deal. How's the hunt for old things going in Sheffield? -We're looking for 100 years old. -Now, this is an oak coffer. It can be used for storing blankets or treasure. buried, undiscovered - full of things! -If you look a bit harder now, you'll see something. -Yeah. Oh, there you go! 250 quid. How cheap is that? -Bearing in mind how old it is! -to you about this one, though. -Put your umbrellas and walking cane. -know exactly what it is? stick stand - sticks and umbrellas. -This is a stick stand. -Yeah. When was it made? -So I would say 1840s, '50s? OK, well, 40 years out, that's not bad, for an amateur! Look, in the world of antiques, it's nothing! It's minutes out - that's all! in the market the way it is, it has to be cheap. Now you're talking Suzanne's language! No ticket price, so time to get the big cheese in. tell us everything you know about the stick stand. I know it's a lovely Victorian stick stand. -It's got its original liner. Arts and Crafts. A lot, lot going for it. -Is it particularly cheap for us? -I think it's really cheap. -Yeah. I think it's priceless. -15 quid? What about 65 quid? I thought I heard the word "cheap"! -It's a beautiful piece of Victoriana. What's the absolute death on it? -The absolute death on it is £45. -You know what I'm like! -I will throw the stick in with it. -Do you know what, then? That's a deal, then. -Yeah, I'd be happy with that. -Go on, then, shake his hand. -I learnt a lot there. with its very own stick, for £45. -Nothing else we can do. But time's running out back in Barnsley. silver photograph frame, so we've got the hallmarks there. It's quite a good stock item. -something like this, is all. -And look at the back. Always look at the back. Because nobody's going to buy anything with a floppy stand. Quite right! Rachel's off to consult the vendor. Here's hoping she can bring back a discount to please Susan. -Time and place, time and place. -There would be 50% off. -That would take us down to 12. -is very unhappy, aren't you? -Go on. Go on. Go on! Oh, you're welcome, you're welcome, you're welcome. Become quite the pair, haven't they? for a grand total of just £18. -Time to show off your wares, then, lads! -It looks like a house clearance! that looks like a very disappointing collection. -Oh, you haven't seen it, David. -I've got it, I've got it. -They got in there first. -I am liking the decanter. -That is a beautiful thing. -And the stopper fits perfectly. -And we've got the James Braxton brass tray. -I would be disappointed not to see one. -Arts and Crafts, Mrs Arts and Crafts. -That is a lovely mirror. -Go on, probe me on price. -That is in beautiful condition. opposition, is the double Mouser. -It could be 200 quid all day long. -How much did you buy it for? So you'll get 200... You'll get 20 quid? -See, he's smiling again now. -OK, I feel a bit better. -Because... Aw! I do, I feel a bit better. LAUGHTER I think they look nervous. -Right, come on, stop laughing. Come on! OK, shall we do it gently? Look at that. What's that? -Watch their faces when they see this. -Oh, we have to do this! -Yeah, we got this as well. -Don't get too excited now. -It's like a horror movie. OK, tell me, James, which object do you like the best? You wouldn't get over my threshold with the rest. A late 19th-century train ticket machine. -It's got ribbon and everything in there. How much was the vinyl-covered piece of furniture? Oh! What do you think? -OK, my arm was up my back? -I was going to say 20 quid. -I can't believe it, I can't believe it. Do you think there's going to be a profit in that one? -Yeah, may the best team... Team! Team! -"Tell us what you really think." of James and Susan's highly ordinary collection? But actually, I think it is. I think it's a bit predictable. You look sort of slightly frowny, what's going on? -very much for their items. -lot of money for theirs? -No, I wouldn't. No, I wouldn't. -That's not going anywhere. It's certainly not going in my house. No, it's not going in my house either. -And we've spent about £300. -They've just tickled over 100. -We have it. Come on. -I'm going to be so excited! -Yeah, come on, let's go. -Cup of tea, cup of tea? auction in the Lancashire town of Warrington. -I am so excited about this. Do you know, I am as well, because I've never done it. -I've never ever been to an auction. We can say this, because we're good mates. Do you honestly think you're going to make money? Forget what James and David are saying! -Do you reckon we'll make money? potential to make more money, cos you bargained very well. 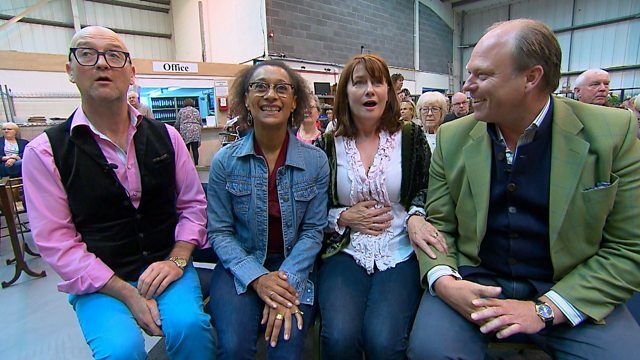 smiles all round at Warrington Auctions. -Look at the size of this place! That's a good sign, isn't it? Yeah! The bidders are in the room and online. So here's hoping! -Oh, here they are. Right. Gosh, they look good now. They look smiley. Lovely to see you, too. Oh, you're gorgeous and warm! Suzanne, have you been to an auction before? -You're in for a treat. let's remind ourselves of what everyone's bought. auction lots for a total of £288. £119.50 but also have five lots for auction. But what does auctioneer Peter Critchley make of it all? I like the Gothic stick stand. original drip tray, which is very good. to do very well here. The wooden tray is probably the most valuable item brought in today. which that tray is, so it's a very nice item. So, time to get things started. First up are Suzanne and David's figures. Nice things, these. Ten is bid. Ten is bid, looking for 12. -£10 in the room. Is there £12 anywhere? Ten I have in the room, I sell at ten. -I'm not telling you, I'm not telling you! that was putting them off. Harsh comment and a tough start. but there's plenty of time to make it all back. -It's such an individual taste. Not everybody... But somebody's bought them! How quickly words of comfort turn into cheek! your Arts and Crafts tray is up next. Ten online, ten online, looking for 12. £10 online, is there 12? £10 online, is there £12 anywhere? Ten's the bid, then. I sell at £10 only. but it's a profit to start you off. -It's a profit, it's a profit. From one plate to another. Well, two of them, actually. Surely, Suzanne's haggled deal will come good? -Ten online, looking for 12. Ten online, is there 12 anywhere? -Oh, it's got to be more. -Ten's the online bid, then. Is there £12 anywhere? Ten's the bid, selling at ten. Does anybody buy in the room? Mind you, it's still five times the money. but a first profit for Suzanne and David. -We're on the way back! is James and Susan's silver photo frame. -I've got a feeling in my waters it's going to do well. You could nip to the loo, James, you've probably got time. Start me off at just £10 on this one, please. -Someone's got to go for £10. Ten is in the room, ten is here in the room. -Ten is in the room. In the room at 15. Looking for 18 now. 18 online. Do you want 20, sir? 20 bid, 20 bid, looking for 25. £25 online. -I'll sell online at £25. Oh, they're creaming us! We've got to get a move on here. Suddenly, it's all come alive. Do you know what, though? They're all creeping up! but will it bring them a historic profit? -Here we go. Start this up with me at £40. -Start me at 20, then. 20 online! OK, we've started. it's an unusual item. We've never had one before. We'll never have one again. a quirky slice of history for a very reasonable price. -I'd have been all over it. -Like a rash, wouldn't you? but will it serve them up a profit? Start me at 30 on the lot, please. £30? Start me at 20, then. £20? Nothing in the room? £30 online. It certainly knocked James for six. with their first loss of the day. That's a bargain, then, they've got, then. help Suzanne and David make a profit? -Start me at 20. 20 bid, 20 online. 20 online. -There you go, I told you. £20 online. Is there 25 anywhere? £20 the online bid and selling. I can't believe it, I can't believe it. -Shocked! I am so shocked! That is not bad for a skip buy. -We haven't done well, David! And I thought we were such... I thought we were the A Team. -We WERE the A Team! I think we're the Z Team now. Can the 1950s mirror fare any better? Start me at £30 for the Art Deco mirror. 35 in the room. Looking for 40 now. -40 online, have we got 45? -Come on, a little bit! £40 is the online bid. Is there 45 anywhere? -£40 for the Deco mirror. Aw, disappointment all round as the mirror clocks up a loss. -I'm not positive about our last lot. Suzanne and David's final lot is the Victorian stick stand. OK, Sue, this is it. Start me at £80. £80. -Come on! Let's get some action. I've got 60 here, then. Looking for 65. I've got 65 online. -Do you want 70 at the back? I've got 75 here. Do you want 80? We're in the room at 80 now. Is there 85? is there 85? £80 in the room, is there 85 anywhere? 85 online, is there £90 anywhere? Well done! Well done, David! A great profit on their final lot, well done. God, you do know your stuff! You've just gone right up there. Look, he's floating! -A bit more, go on. Thank you very much! That did cheer me up! is the much anticipated Mouseman tray. -James, I'm feeling a bit nauseous now. -Yeah, I've got real butterflies. 150 I have, 150 I have online. 160 I have, looking for 170. 170 I have, looking for 180 now. 170 I have. Looking for 180 now. 170 I have. Is there 180? -Come on, come on, it's beautiful! at that price. But what does that mean for the final totals? -Guys, I think we need a sugary tea. Susan and James started out this road trip with £400. leaving them with a total of £341.60. Suzanne and David also had £400. They too made a loss, after auction costs, but only losing 60p. and makes them today's winners! -Oh, well, it's been a great journey! -It's been gorgeous, it's been gorgeous! -Thanks for being a great partner. You know you... You know you want to! I'm so glad we got this as a payment, Suze. We definitely have got the best deal. What a fantastic experience this has been. And I'm not bothered at the outcome. If I got the opportunity to do it again, I would. -Yeah! Oh, yeah, in a heartbeat. -Yeah. We'll be the experts next time. Actors and friends from Casualty, Susan Cookson and Suzannne Packer swap surgery scrubs for a 1965 Sunbeam Tiger as they battle it out around the north west of England, assisted by James Braxton and David Harper. Susan discovers her inner haggler, while Suzanne keeps the purse strings very tight as she bids to discover an item with some real age. As the trip winds across Yorkshire, there is the chance to meet a very special woman from Sheffield and a look around some incredible gardens with an amazing history.